In emergency situations, conditions can deteriorate rapidly. 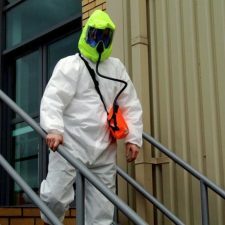 Ambient breathing air can be suddenly filled with smoke or toxic fumes and rapid escape is the only available option. The Dräger Saver CF N constant flow Emergency Escape Breathing Apparatus allows safe, effective, and uncomplicated escape from hazardous environments. 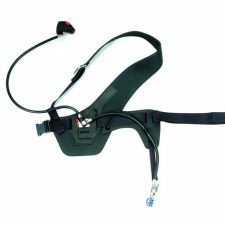 Simple to don and easy to operate, this hood-based, positive-pressure breathing device can be used with minimal training. This emergency escape breathing apparatus is highly visible and was designed to be suitable even for people with glasses or facial hair. 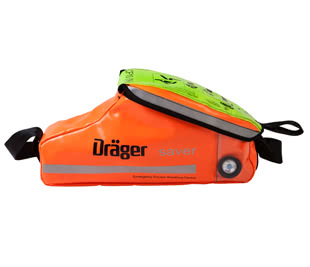 The Dräger Saver CF N EEBA gives the wearer the precious additional time needed to exit the area safely. Packaged in an integrated carry bag, the Dräger Saver CF N can be easily wall-mounted in strategic locations in potentially hazardous areas. 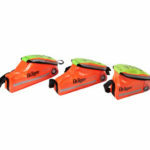 The bright orange bags feature photoluminescent panels for enhanced visibility, even under low lighting conditions. 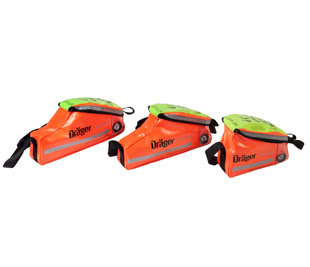 When needed, the Dräger Saver CF NIOSH can be worn either as a chest bag or over the shoulder. The Dräger Saver CF N utilizes a simple, fail-safe reducer system with excellent flow characteristics, providing a consistent rate of air flow until the cylinder is completely empty. 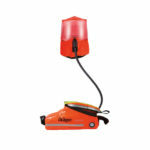 It can be equipped with cylinders which can hold either a 5, 10 or 15 minute supply of air. The flame-retardant hood incorporates a large visor for maximum peripheral vision. The Dräger Saver CF N complies with NIOSH, ABS, SOLAS and TC approvals. It can be used in a range of applications both on and off-shore to protect the user against any unexpected change in environment. Chemical, oil & gas, shipping, steel, and pharmaceutical industries can all rely on the Dräger Saver CF N for safe and uncomplicated escape. The Dräger Saver CF N requires very little service or maintenance. A transparent window on the soft bag lets you check the cylinder pressure gauge easily without unpacking the unit. The cylinder can be refilled, for reuse.